Your shopping list might look a little different when you start tracking your macros, but you will soon find your go-to favorites and grocery list staples. In the What are Macros section, we gave you a ton of great starting places for proteins, carbs and fats but brainstorming your favorites is going to be a huge help. Here are some more ideas organized into vegetables, fruits, dairy products, fats, proteins, snacks and macro-friendly condiments. Print this visual, circle your favorites and use it as your first shopping list! 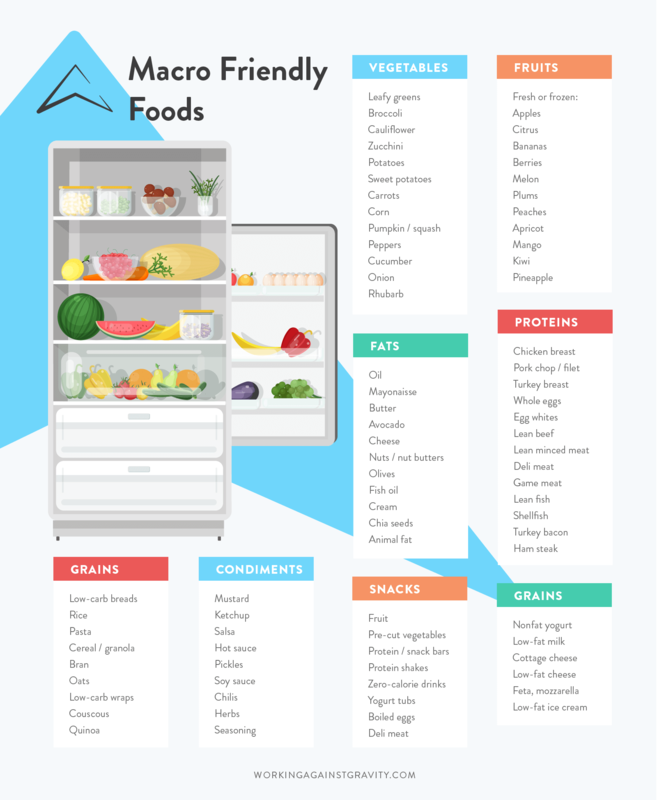 Those are just some general ideas but we also know that there are a lot of fabulous macro-friendly foods hidden in your favorite grocery stores. Thankfully, we did the digging for you and came up with a few lists of delicious foods you can fit into your day with ease! Check out our blog articles on Macro-Friendly Shopping at Costco, Macro-Friendly Shopping at Trader Joe’s and Macro-Friendly Shopping at Vons/Albertsons. Need more inspiration? Take a virtual peek into some of our coaches’ refrigerators by reading Coaches Grocery Lists for more specific ideas. Is there anything you noticed? Those lists are mostly full of whole, nutritious foods but you’ll also see frozen yogurt, dark chocolate and lower sugar versions of favorite foods.